It's our hope. 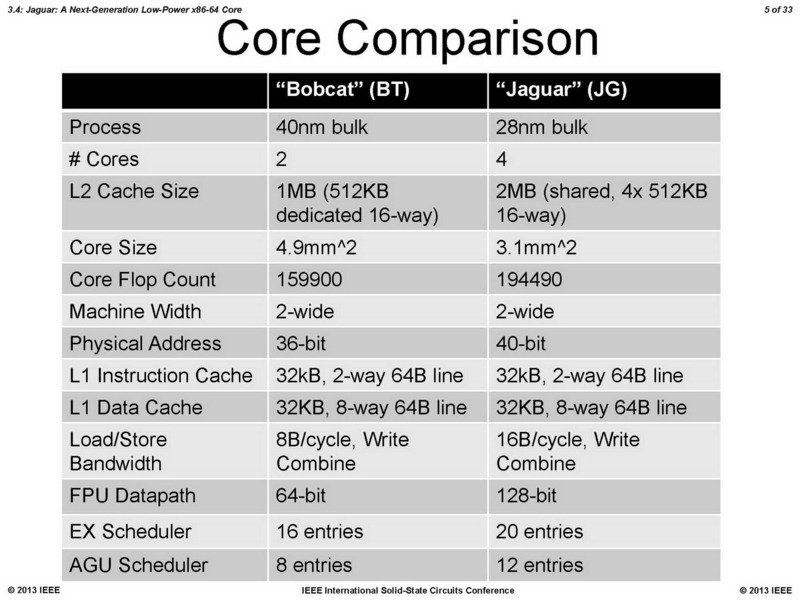 More than 2.5 years after "Bobcat", AMD launch the successor of its successful low voltage architecture. The new APUs called "Kabini" and "Temash" are designed for notebooks as well as tablets. We review the A6-1450 quad core model. AMD landed a coup with their C- (Ontario) and E-series (Zacate) over 2.5 years ago: The competition did not stand a chance against the very frugal processors capable of many everyday tasks and even simple games in the low price segment. Intel's Atom chip from that time was simply too slow and the higher-value ULV models were significantly too expensive. Meanwhile, the market changed: The once booming netbooks are almost extinct and were replaced by slim subnotebooks and tablets. The performance and energy efficiency of the 40 nm APUs based on the "Bobcat" architecture are only partly convincing today as Intel launched a strongly revised Atom successor called "Silvermont". So, a new chip with more performance and less power consumption is demanded. First of all, we want to briefly describe the design of the "Kabini" (notebook version) and the "Temash" SoCs (tablet and subnotebook version). Afterwards, we will have a look at performance and power consumption. From a technical point of view, Kabini and Temash are most likely one and the same chip. However, clock rate and features of the models are adapted to their field of application, and so, their TDP ranges from about 3 to 25 Watt. 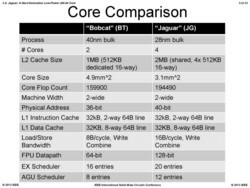 The four CPU cores of the SoC are based on the new Jaguar architecture, which, alike Bobcat, aims in minimizing power consumption and size. 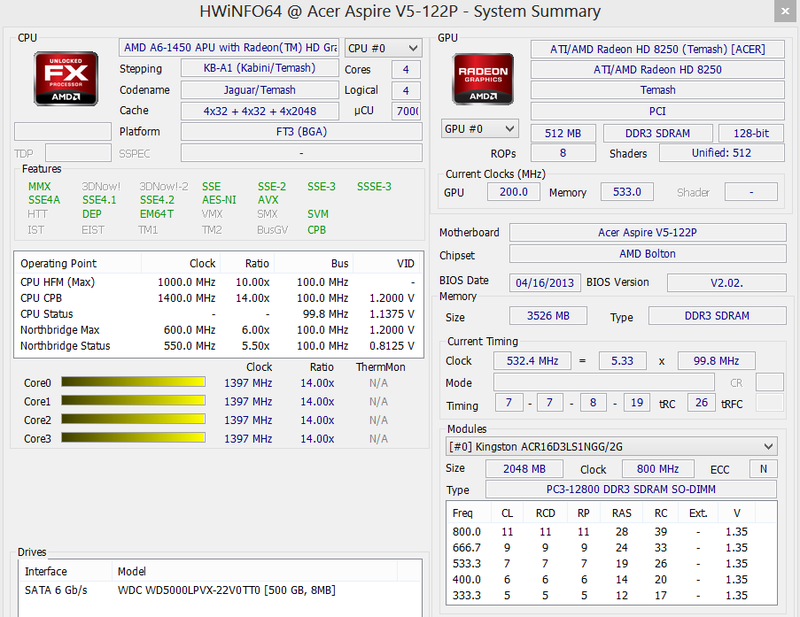 Thanks to a 128 Bit FPU and further improvements, the performance per MHz has increased by about 15% according to AMD. We will check this later. Furthermore, it also features modern instruction set extensions like AES and AVX. In the graphics card, the older VLIW5 architecture was replaced by the more efficient GCN design. It also houses 128 shaders (two compute units) instead of 80. 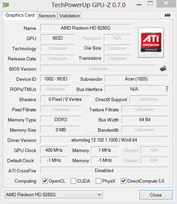 Besides a significant performance gain, the new GPU also implements a wide feature set including DirectX 11.1 support. As "genuine" SoCs Kabini/Temash not only integrate CPU and GPU, but also the memory controller (single channel DDR3-1600) and the Southbridge. The latter comes with modern interfaces like SATA-III and USB 3.0, so notebook manufacturers do not need additional chips for these. So far Kabini and Temash have not been officially introduced by AMD. Therefore, not many devices use them yet. 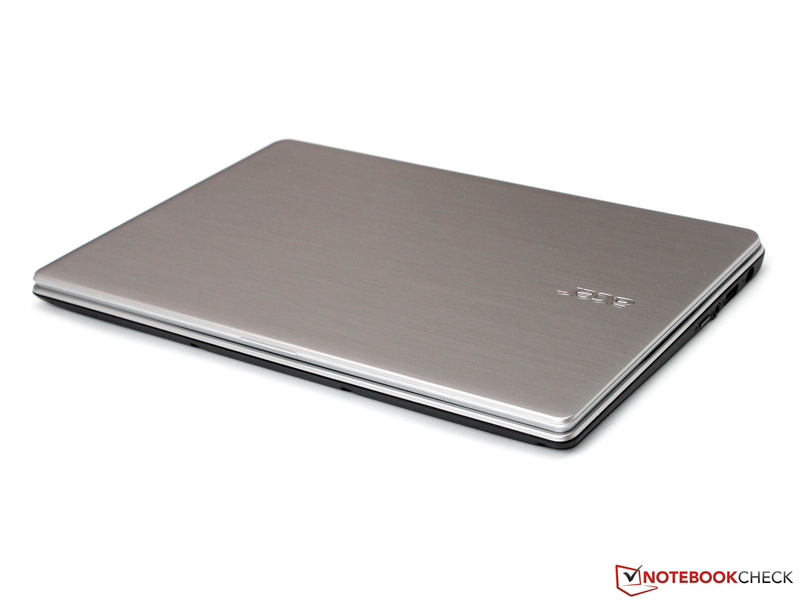 At the time of writing the Acer Aspire V5-122P is the first and only notebook with such an SoC that several online shops in some countries have in stock. 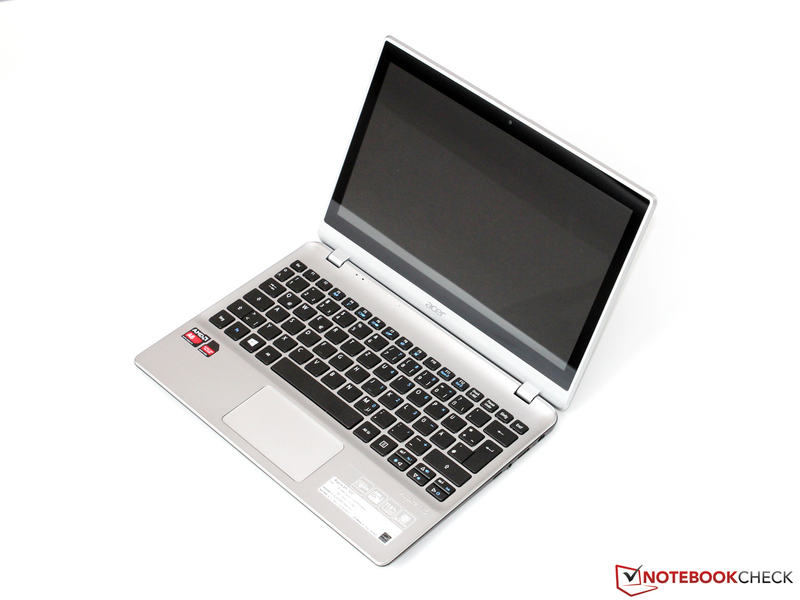 The 11.6-inch subnotebook features the Temash APU AMD A6-1450, a Radeon HD 8250 graphics card, 4 GB RAM (2 GB soldered) and a 500 GB hard drive. Despite a cheap price of 450 Euros (~$582) Acer built in a high-end IPS display with touchscreen with a resolution of 1366x768 pixels. The manufacturer promises up to 5 hours battery life with the non-removable 30 Wh battery. The first impression of the V5-122P with silver gray aluminum looks is convincing: Although the 1.38 kg and 2.1 cm high case is only made from plastic, it has a decent build quality and high stability. In particular, the display hinges are pleasingly stiff and very accurate. They also hold the lid well in position during touch inputs. So far, we have not seen a cheap, energy saving quad core processor for low-end subnotebooks and tablets amongst x86 compatible CPUs. However, you should not expect vast performance: The low clock rate of 1.0 GHz often inhibits better results. 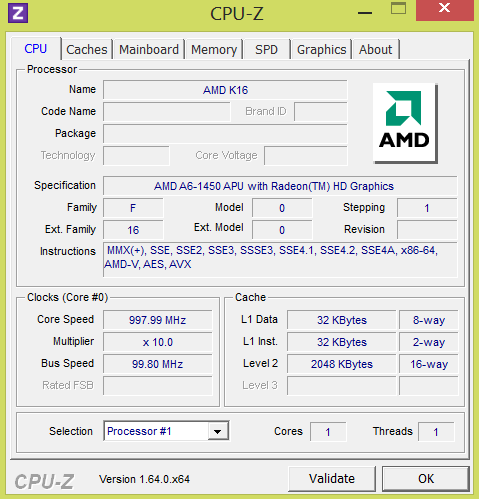 AMD integrated a Turbo mode (Turbo Dock is not available on the Aspire V5-122P), which could increase the clock rate in 100 MHz intervals to up to 1.4 GHz, not without reason. 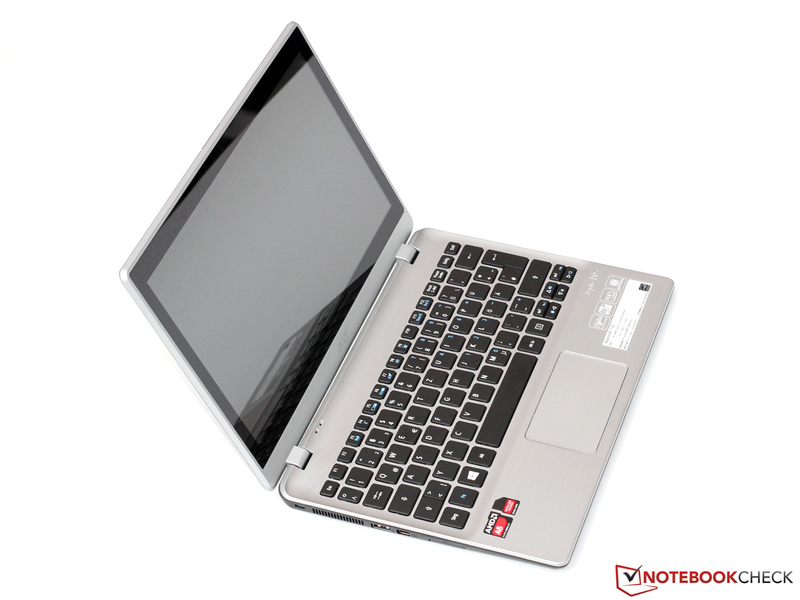 In order to activate it, the notebook must use profile balanced or maximum performance (independent of battery or mains operation). Unfortunately the Turbo was only partly efficient in our measurements: The processor only clocks with the maximum of 1.4 GHz during single thread load. The average clock rate sinks by about 100 MHz with every additional thread. We intentionally refer to the average as the clock of all four cores permanently fluctuates between base and turbo clock. 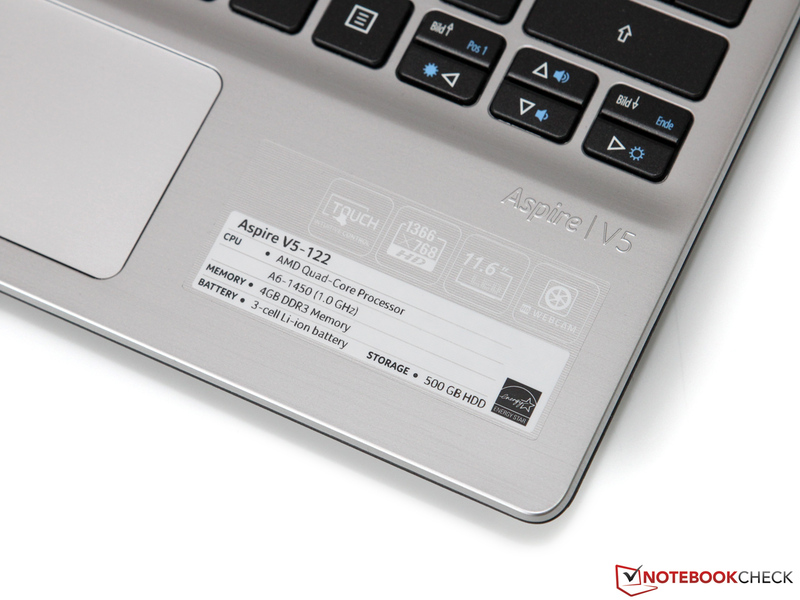 In the absence of any other test models, we cannot tell whether this is a special feature of the Aspire V5-122 or the general characteristic of the A6-1450-APU. 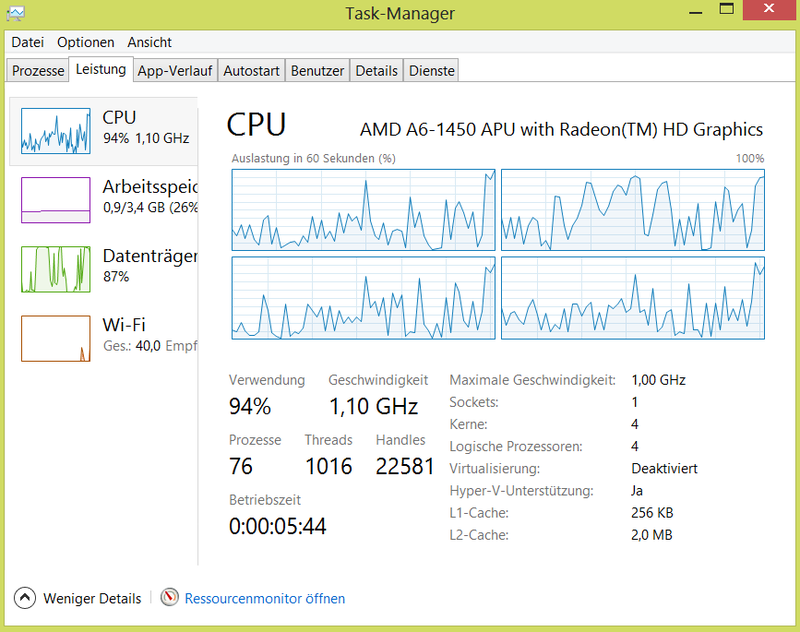 If it constantly clocked at 1.4 GHz, it would perform better. However, we do not think that downclocking caused by TDP or temperature constraints is plausible during CPU only load (see power consumption/temperature). In the single thread test of Cinebench R11.5, the turbo clock of 1.4 GHz manages to keep up with the 1.7 GHz fast E2-1800 based on the Bobcat architecture. Performance per MHz increased by over 20%. But this also means that the A6-1450 is hardly faster than its predecessor models in applications which cannot use more than two cores. This is not completely unimportant in everyday use. In many installation and loading processes, browsing and still in many applications, the performance per core determines the total performance. However, the APU can shine in multi-threading. On average, the A6-1450 is on par with the A6-4455M (ULV Trinity). Given the low clock rate (average clock rate of only 1.0 to 1.1 GHz) this seems quite respectable. The Temash is even about 50% faster than the E2-1800 and the Atom Z2760. We did not even consider special applications like Truecrypt with AES acceleration here. In general, multitasking is a big strength of the processor. You can simultaneously run two YouTube videos in full 1080p resolution without problems. The best way to conceal the modest performance of single tasks is doing multiple things at once. So, the system appears to be subjectively rather fast. Nevertheless, we have to pose the question: would it not have been better for AMD to incorporate just two, faster cores? Unfortunately, the analysis of the graphics performance is complicated by the fact that none of the test tools could read the clock rate of the GPU. Therefore, we cannot tell when it ran at the base clock (300 MHz) and the turbo clock (400 MHz) and if other clock rates in between the two are available. Depending on the benchmark the integrated Radeon HD 8250 partly only reaches the performance of its predecessor (3DMark06), but can also sometimes nearly approach the performance of Intel's HD Graphics 4000. This might be because the older 3DMark benchmarks depend on the CPU. 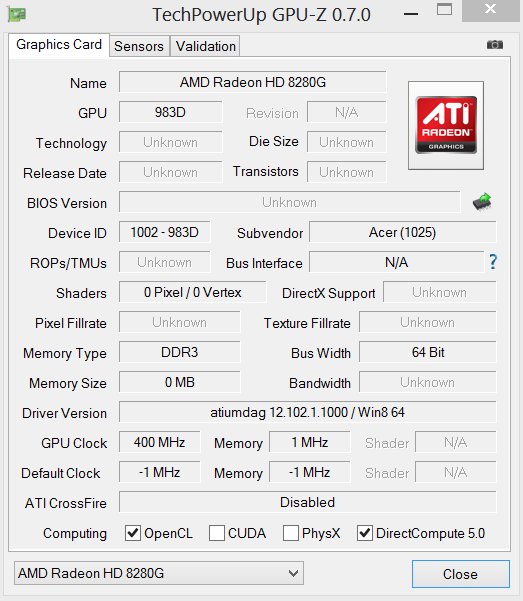 To summarize, the GPU performance is about on par with the HD Graphics (Ivy Bridge)'s or the dedicated Radeon HD 6450M's. In our GPU limited "high" settings of Dirt: Showdown the A6-1450 achieves a decent place between ULV CPUs of the Sandy and Ivy Bridge generation. However, the game does not run smoothly with this setting. So, the user will reduce resolution and details in practice. While the frame rate of the Intel models increases to a (just) acceptable level, the performance of the APU hardly improves, as lower presets just relieve the GPU, but hardly the processor. The same is true for several current (and older games). Unfortunately, you cannot circumvent it. Only titles with low CPU-demand can run smoothly on the A6-1450. But, the main competitor of Temash is Intel's Atom platform and current Atom models perform even worse in games or cannot run them at all. Although we could only measure the power consumption of the whole device, it allows interesting conclusions about the APU's. The low consumption of the CPU cores is especially surprising. The device only needs between 3.4 to 4.6 Watt in Cinebench R11.5 and 6.6 Watt in Prime95 (difference between idle and load with same brightness etc.). The efficiency of the power adapter and voltage converter have yet to be subtracted here. It seems that the power consumption of the GPU is significantly higher. Although FurMark only slightly loads the CPU, the power consumption differs by more than 10.9 Watt. This seems to be the limit as the APU throttles to 800 to 900 MHz CPU clock despite uncritical temperatures, if we run Prime95 simultaneously. So, speculations that the A6-1450 has a TDP between 8 and 15 Watt depending on the Turbo could be true: If the CPU runs at its maximum clock under full stress, the power consumption would be nearly 15 Watt. However, an official TDP specification of AMD is still missing. The low power consumption of the APU has a positive impact on the entire system. The notebook remains very cool and relatively quiet during many simple tasks like office or surfing. Under load the fan increases its speed, but the system noise never gets disturbing. The core temperatures of the chip range from 50 °C while idle to above 80 °C during the stress test. In battery life, the small 30 Wh battery is obstructive. The user can only expect a battery life of about 3 hours during web browsing with medium display brightness and active WLAN. AMD's new APU leaves a mixed impression in our first test. In consideration of current software, it does not appear to be sensible to incorporate four relatively slow cores. This is not only true in applications. The weak CPU part also slows down the relatively powerful graphics unit. Faster Kabini APUs with up to 2.0 GHz clock rate could perform better here. However, let us not forget about the positive aspects: The performance is remarkable compared to Intel's Atom and current ARM SoCs. In addition, the performance reserves are absolutely sufficient for office and multimedia. Furthermore, the power consumption is low enough that also small devices can drain the waste heat without problems. There is no doubt that the new Jaguar architecture has potential. It's up to the manufacturers to launch a broad choice of attractive models. As so often, the price might finally decide between success and failure. 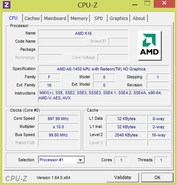 > Notebook / Laptop Reviews and News > Reviews > Archive of our own reviews > Review AMD A6-1450 APU "Temash"